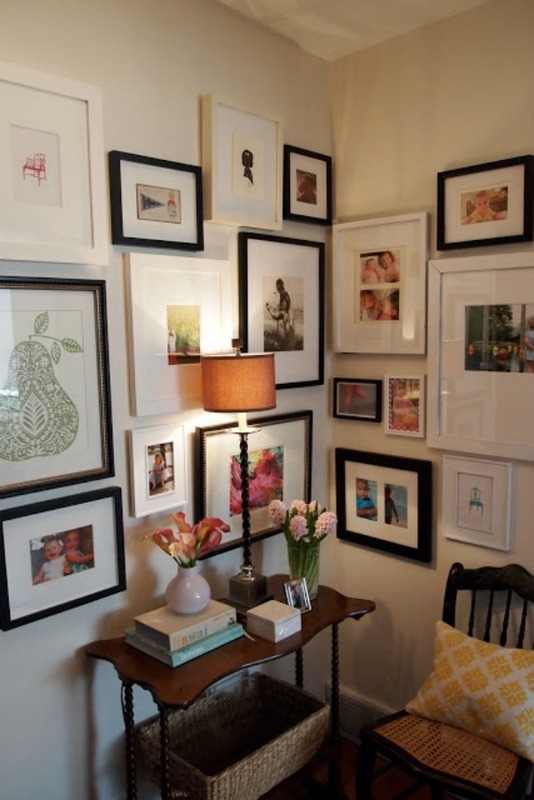 One of my favorite things to see put together by the bloggers I follow is a gallery wall. The possibilities for displaying your favorite things on a gallery wall are endless - pictures of children, their artwork, family mementos, symbolic objects, a framed piece of nature. It all looks good in a creative grouping. I decided to give it a try myself on one of our snow days back in March. 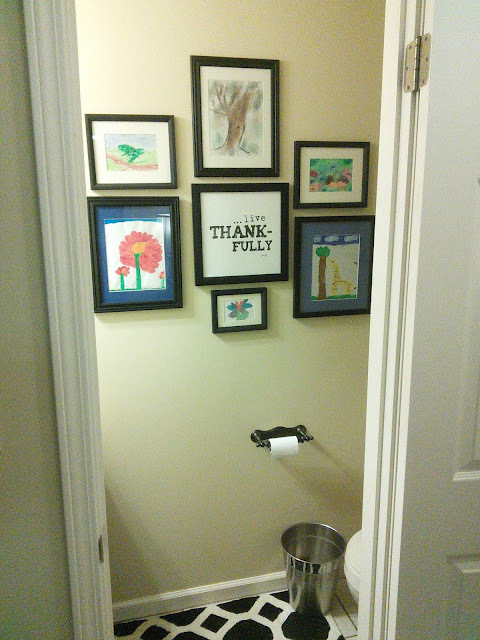 I was using these two pictures in my half bath - the art work of my two older children. My mom originally had these framed and she was using them in her house. She gave them to me a while back when she changed up some of her space. I had several white, inexpensive frames that I wasn't using stuck in a box in my hall closet. They came with mats to match the frames. I also had left over black spray paint from some other project. The only thing missing was the pictures. So, to create my gallery wall, I did what I had been putting off for years - I went through ALL of my kids' artwork that I was keeping on a shelf in my laundry room. It had been piling up for, oh, about twenty years. I only cried a little (OK, a lot) as I searched for the perfect pieces to create my first gallery wall. Here are two gallery walls I love. The first one is from Emily A Clark. The gold and black frames with the black and white prints mix perfectly - sweet simplicity. The next one I really like turns the corner...literally. This one is from the Little Black Door blog. Using their examples, I decided on an animal/nature theme for my wall. So, as I was digging through the years of preschool, kindergarten, primary, and elementary school memories, I pulled out all of the pictures that fit the theme. The flower picture from above and this flower are by my daughter. She's nineteen, and this fall she will be a sophomore in college. And the tree and the small flowers are by my youngest son. He's fourteen and starts high school in the fall. I found the "Live Thankfully" sign at Hobby Lobby ($9.99) - not really sure what I planned to do with it months ago when I bought it. I just really liked it. The blog at the time of this project was just an idea, so I don't have step-by-step directions photographed. But there really wasn't much to it. I spray painted the white frames with the left over black paint. I used the mats as my guide and simply cut the pictures to fit, taped them to the mat, and put them all back together. I arranged the pictures multiple ways on the floor until I liked what I saw. Then hammered them up. Definitely a productive snow day. And I didn't spend a dime. Hard to imagine a day cold enough for snow in this July heat! Thank you for reading along and taking a minute to leave a comment. Your thoughts make my day! I love hearing from you and appreciate your feedback. I'm Kathryn and this is where I share decorating ideas, projects, recipes, and a little about my life as a wife, mother of 3, and teacher. Thanks for stopping by! I hope you find some inspiration and smile a time or two while you're here. Sign Up! Get new posts delivered to your email.